we make pretend camp fires on the playground nearly daily (this also cares for the direction from the state surveyors to keep the playground “free of sticks”). 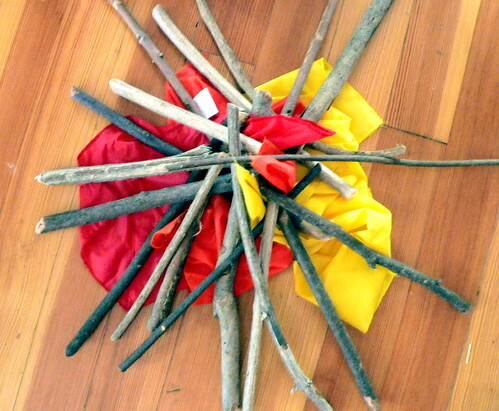 during parts of the year we bring the camp fires inside and offer our red, yellow and orange scarves. then there are always a couple who ask for blue scarves (for the “really hot part”). i even splurged once and bought a wooden s’more/kabob food kit. sweet. Your blog is great! I got so many ideas! I love the sewingidea. So simple! I am new to teaching preschool. I’ve been working in the room for a few weeks, getting used to the children and the routines of teaching in a preschool. I absolutely love your blog! I will be checking it frequently for updates. Wow. What a wonderful blog! I am on my last day at work today, but will definitely use you as a resource for planning for the fall. I’m really impressed — I love the pictures and all your ideas. I can tell you have a terrific, child-centered, creative classroom.